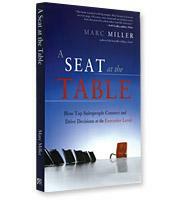 Bestselling author Marc Miller delivers a new, critical tool for connecting with decision makers to make more and bigger sales. He offers a new sales approach designed to help salespeople earn A Seat at the Table – the place reserved for those select people who set the direction and the budget of an enterprise. How to use a simple, analytical matrix for illuminating customer strategies. How to use a methodology that will have every contact offering up the information that you need to make the sale. How to generate recommendations that are perfectly aligned with customer strategic needs. How to close more and bigger deals — and help your customers succeed.